The cecum is the most proximal part of the large intestine and is located between the ileum (distal small bowel) and the ascending colon. Having served as a site for cellulose digestion in our ancestors, the cecum now simply acts as a reservoir for chyme which it receives from the ileum. In this article, we shall look at the anatomy of the cecum – its anatomical structure, neurovascular supply and lymphatic drainage. The cecum is the most proximal part of the large intestine and can be found in the right iliac fossa of the abdomen. It lies inferiorly to the ileocecal junction and can be palpated if enlarged due to faeces, inflammation or malignancy. The cecum derives its name from its inferior blind-end (‘cecum’ is derived from the Latin word ‘caecus’, meaning ‘blind’). Superiorly, the cecum is continuous with the ascending colon. 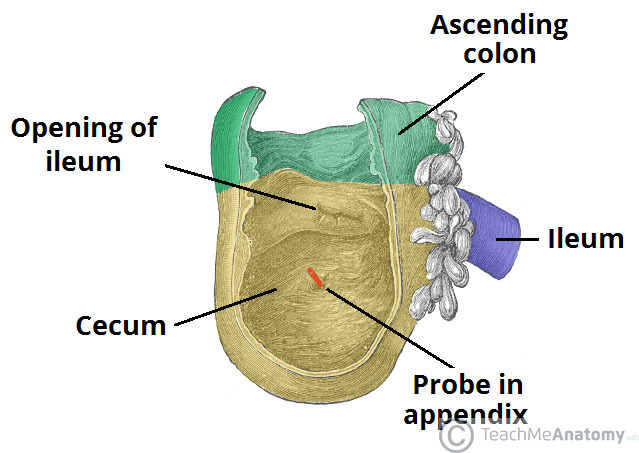 Unlike the ascending colon, the cecum is intraperitoneal and has a variable mesentery. 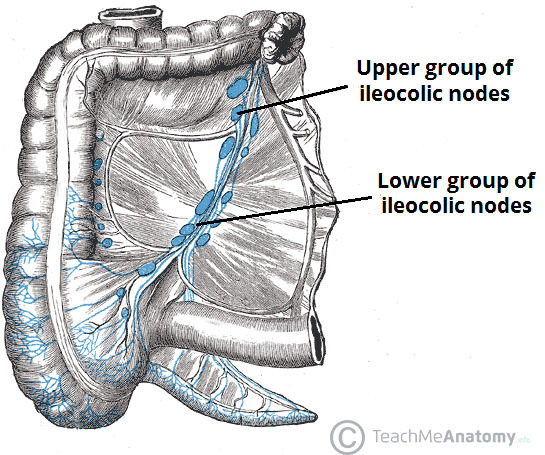 Between the cecum and ilium is the ileocecal valve. This structure prevents reflux of large bowel contents into the ileum during peristalsis and is thought to function passively, as opposed to be a defined muscular sphincter. Note: In cases of large bowel obstruction, an incompetent ileocecal valve is paradoxically advantageous as it allows the retrograde passage of bowel contents back into the ileum. This helps to decompress the cecum and prevent “closed loop” obstructions and perforations. Fig 1 – The cecum. Note the blind end inferiorly, and its continuity with the ascending colon superiorly. The cecum is derived from the embryologic midgut. Therefore, the vascular supply is via branches of the superior mesenteric vessels. Arterial supply is from the ileocolic artery, a branch of the superior mesenteric artery. It subsequently divides into anterior and posterior cecal arteries, which directly supply the cecum. Venous drainage is provided by the corresponding ileocolic vein, and empties into the superior mesenteric vein. Sympathetic and parasympathetic branches of the autonomic nervous system innervate the cecum and appendix. The is achieved by the ileocolic branch of the superior mesenteric plexus, which follows the same course as the ileocolic artery and carries vagal and sympathetic nerve fibres. Lymph from the cecum drains into the ileocolic lymph nodes (which surround the ileocolic artery). Fig 2 – Lymphatic drainage of the cecum and appendix. 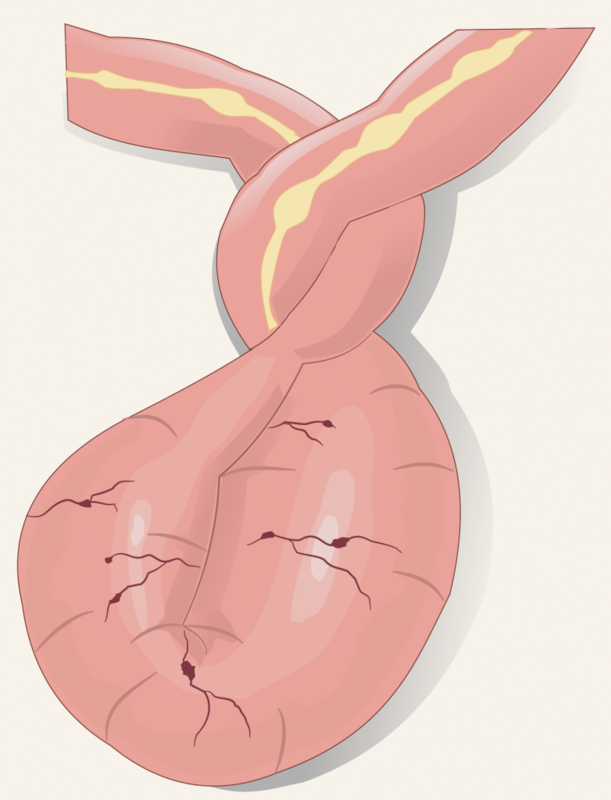 A volvulus occurs when part of the intestine ‘twists’ on itself, causing obstruction of the lumen. Cecal volvulus represents approximately 10% of all intestinal volvuluses (the most common location is the sigmoid colon). Common clinical features include colicky abdominal pain, abdominal distension and absolute constipation. Abdominal x-ray typically demonstrates a distended loop of large bowel that originates from the right lower quadrant. Treatment involves decompression of the volvulus. In cases when bowel perforation has occurred, the affected area is usually surgically resected. Fig 3 – The cecum is a relatively common site for volvulus to occur. Which part of the large intestine is the cecum continuous with? A patient is planned for an ileocecal resection. Which of the following arteries will need to be ligated to permit excision of the cecum? What is the embryonic origin of the cecum?